How much do Americans actually care about Trump’s potential business conflicts? President-elect Donald Trump's media event announcing plans to shift his assets into a trust managed by his sons, but not to give up ownership of the Trump Organization, marks the greatest detail Trump has provided on how he would try to avoid conflicts between his business interests and service as president. While the coming weeks will tell whether Trump's announcement shifts public views of his business conflicts, polls beforehand showed a majority was concerned about potential conflicts of interest, and clear majorities say he should disclose more information about his business dealings. Two surveys released Tuesday offer a fresh look at Americans' view of Trump's potential conflicts. A Pew Research Center poll found 57 percent of adults are very or somewhat concerned that Trump's “relationships with organizations, businesses or foreign governments conflict with his ability to serve the country’s best interests.” One-third said they are “very concerned” about the issue. Separately, a Quinnipiac University poll found a similar 60 percent of registered voters were very or somewhat concerned that “Trump would veto a law that would be good for the country because it would hurt his business interests.” Some 4 in 10 were “very concerned” about this possibility. These two polls found differing results on whether concern is on the rise (Quinnipiac) or falling (Pew), but their overall level of concern is quite similar despite asking different questions. While Democrats are far more likely than Republicans to say they are at least somewhat concerned about Trump’s conflicts influencing his decisions (89 percent vs. 27 percent), a 63 percent majority of self-identified independents said they are concerned Trump would veto that would damage his business interests. The Quinnipiac poll also found 52 percent of voters think Trump has more potential for conflicts than most politicians; only 10 percent said he has fewer conflicts, while 35 percent said he has about the same amount. A mid-December Suffolk/USA Today poll found 35 percent of likely voters saying Trump took “adequate steps to prevent conflicts of interests between his business interests and the country's interest,” with 53 percent saying he had not. The most positive result for Trump on the issue came from a CBS News poll last month which found 50 percent saying they think Trump will make decisions “mostly to further the interests of the American people,” while 44 percent thought he would prioritize the interests of his family and businesses. The same poll, however, found 59 percent saying his extensive business relationships create a conflict of interest that would likely affect how he makes decisions. Heading into his news conference, polls also find clear majority support for specific actions Trump could take to address them. The January Quinnipiac poll finds 66 percent of registered voters say Trump should place all his business holdings in a blind trust. The December CBS poll found 70 percent saying that Trump might still have some conflicts of interest even if he hands off his business interests to immediate family. Americans might accept Trump's proposed arrangement — maintaining ownership of his company while stepping aside from management — according to a December Bloomberg Politics poll. The survey provided a lengthy description of an arrangement somewhat similar to Trump's announcement Wednesday (Trump would take himself “completely out of business operations"), and mentioned that his children might be involved both in businesses and advising him as president. It is not clear any of Trump's children will be involved in both his administration and the company). Given that information, 26 percent said Trump should sell all his businesses, while 69 percent said “that goes too far.” As with any issue that is relatively new, question wording can have a significant impact on results, so it will take additional surveys to know how firm this viewpoint is. On a related question, Trump once again refused to release his tax returns, saying Americans “don't care at all” about whether he makes the documents public, citing the fact that he was elected without doing so. 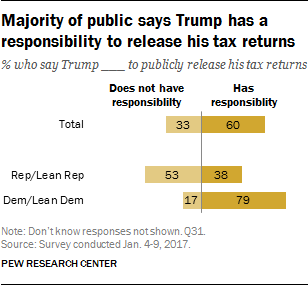 The Pew survey mentioned earlier found 60 percent saying Trump has a responsibility to publicly release his tax returns.